Watch our demonstration to see the impact the system has along with its easy to use operation. 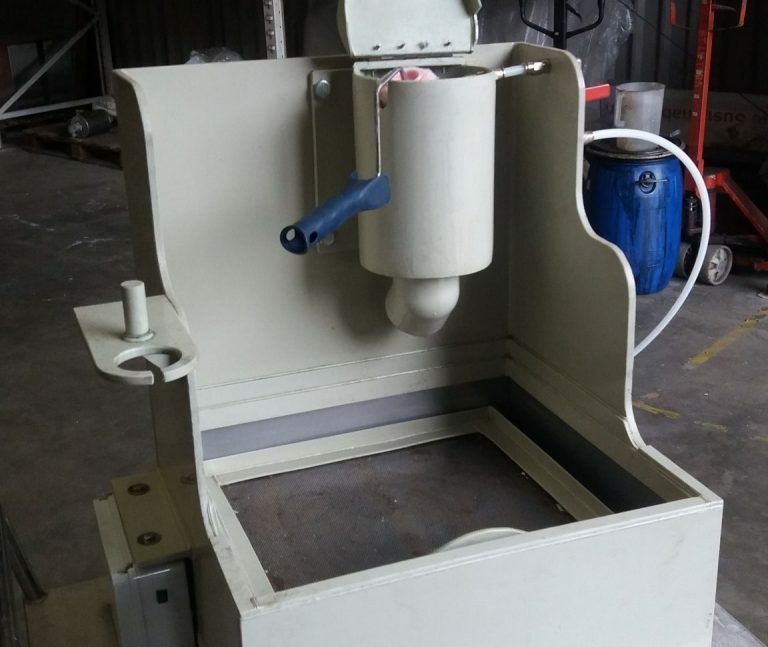 This product has been proven to provide an economically sound investment for any manufacturer using GRP technology, its initial financial outlay potentially recoverable within a matter of months. Leading manufacturers currently using the work station include internationally known brands who are already taking advantage of the significant financial benefits it offers. The ESTAKLEEN work station’s unique and sturdy platform with its 316 quality stainless steel design gives glass fibre operatives an ideal shift end area to rejuvenate their own specific manufacturing tools and offers them perfect preparation for their next day’s task. Its ‘ease of use’ operation with revolutionary patent chemical cleaning process combined with final secure compressed air drying. 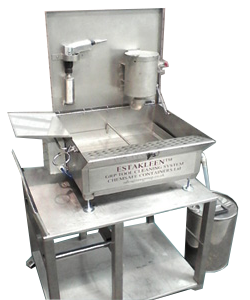 The design of the Estakleen System makes it straight forward to empty the used solvents into the accompanying drums for recovery by distillation, which produces approximately 80% recovery of product for re-use, making this operation extremely simple for the operative as well as being an effective way of maintaining long term tool life. We believe this is the most environmentally friendly system available. Clean GRP Tools, rollers and brushes. Drain used solvent into waste drum which we will collect free of charge, therefore no waste on your premises. What standard sizes of workstation are available? How long does it take to clean a roller or a brush? 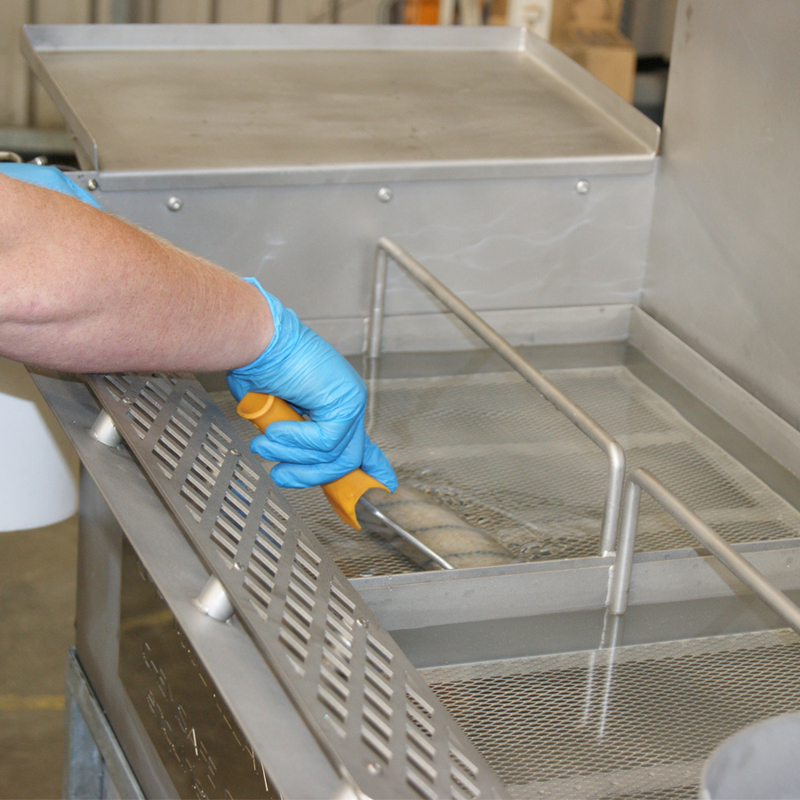 What is the cleaning capacity of the standard workstations before changing the solvent? 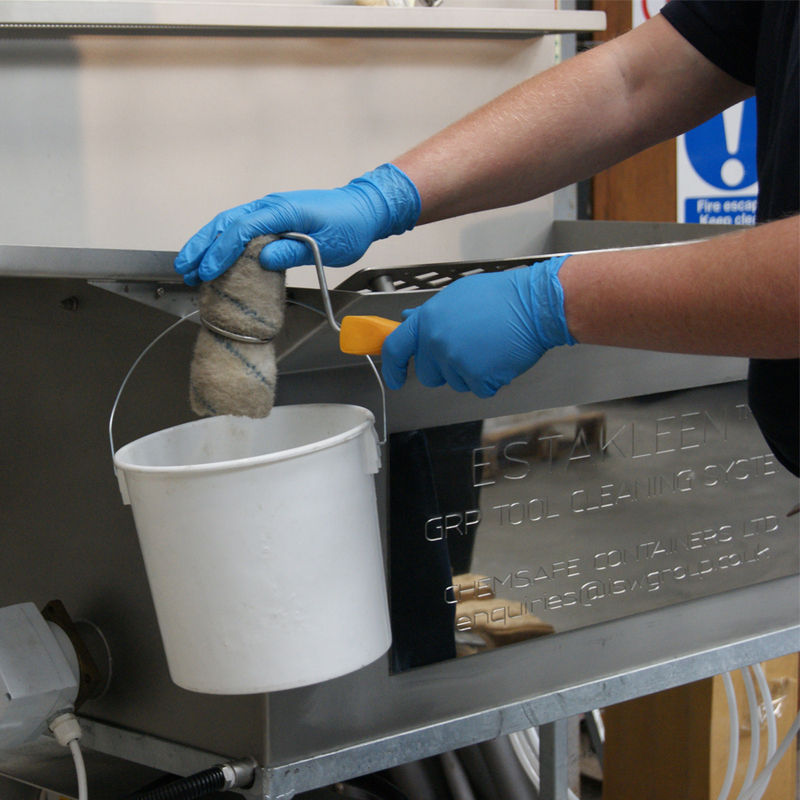 Provided that the fitted O ring is used to remove all excess resin form the roller prior to placing into the solvent. Mini = 5 Laminators cleaning 3 times a day for 5 working days. 2 Man = 10 Laminators cleaning 3 times a day for 5 working days. 4 Man = 15-20 Laminators cleaning 3 times a day for 5 working days. There figures are to give an idea of the minimum life of the solvent as it could last longer. 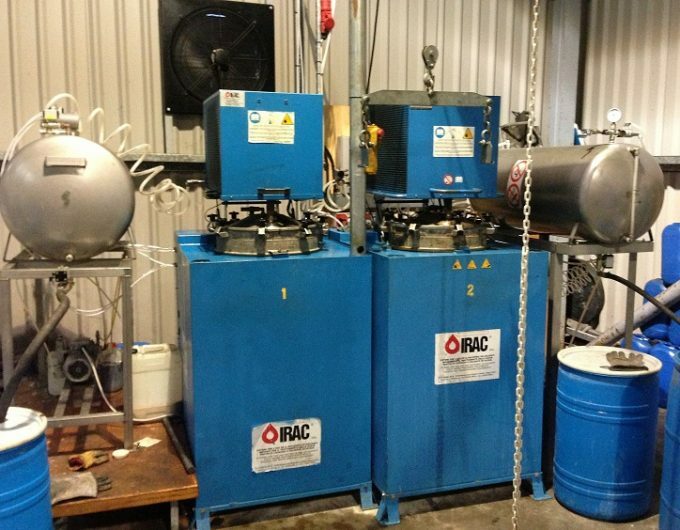 How do you collect the waste solvent? We provide empty 205 ltr drums free of charge and liquid waste Estakleen 70 will be collected free of charge by our haulier. The only cost to you is the standard charge for the water consignment note. As an alternative by agreement we will service and clean your workstation, emptying and replenishing the Estakleen 70 and removing the waste from your site. Using the Estakleen system you will habve no waste solvent on site. How do we keep the waste to liquid form? We will provide an inhibitor free of charge to prevent the waste from hardening. This should be placed into every empty drum prior to filling it with waste solvent. We are not able to recycle solid waste but can take it away for disposal for a standard charge. 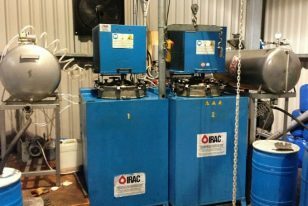 What happens to the used solvent when it has been collected? It is re-proccessed by distillation producing recycled solvent and waste styrene and resin which is drummed and palletised and sent to be used as a cement kiln fuel. 30% virgin Rhodiasolv IRIS is then added to the recovered solvent to make Estakleen 70. Why should I use the Estakleen System? There is no water content. The Estakleen 70 is contained in the workstation and does not evaporate therefore every molecule is accounted for. Why should Estakleen 70 be heated in the workstation? To improve its solvency power. 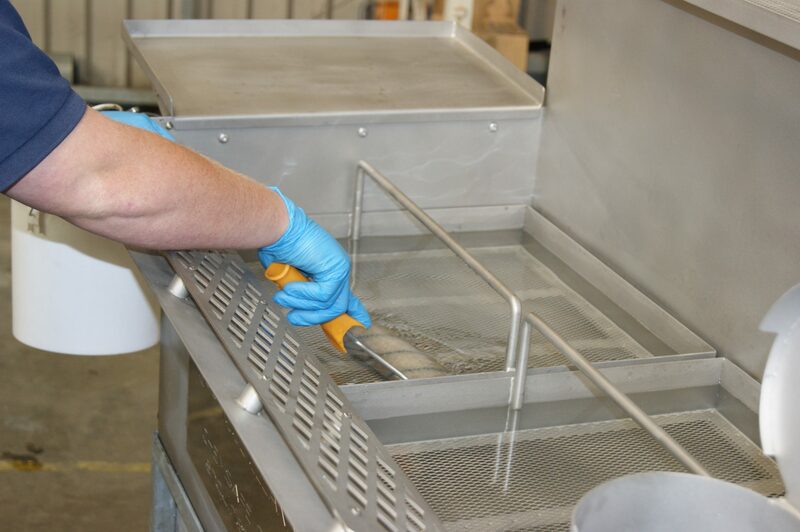 It maximises the retained styrene and resin content prior to saturation. In comparison to acetone how expensive is Estakleen 70? Estakleen 70 does not evaporate and lasts 3 to 4 times longer than acetone in use. All tools cleaned in Estakleen 70 last far longer and emerge in an ‘as new condition’ time after time. Having used Acetone for 30 years within our fiberglass facility, we were needless to say dubious about the effectiveness of this ‘revolutionary’ product being offered to us. On the recommendation of one of our suppliers, we went to view the product Estakleen at the NEC trade composites show. Having been immensely impressed with the demonstration of the product as well as the representative Vince Taylor from Estakleen Systems. We were offered an in-house demonstration which we gladly accepted. We were so impressed with the demo, we decided to order a Mini Station. Your demo and installation visit gave us clear and concise instruction on how best to use and look after the Mini Station, we couldn’t have been more happy with the process. 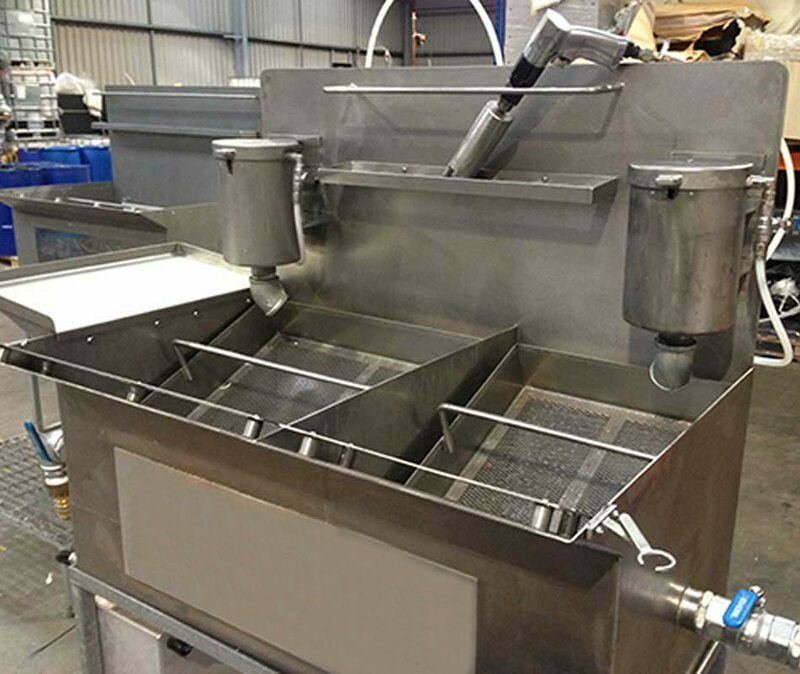 The health and safety aspect of Estakleen over acetone was the primary reason for the switch and an added bonus is the hassle-free removal of the waste by Estakleen Systems. I would strongly recommend any company, large or small, that is searching for an alternative cleaning system to try Estakleen. 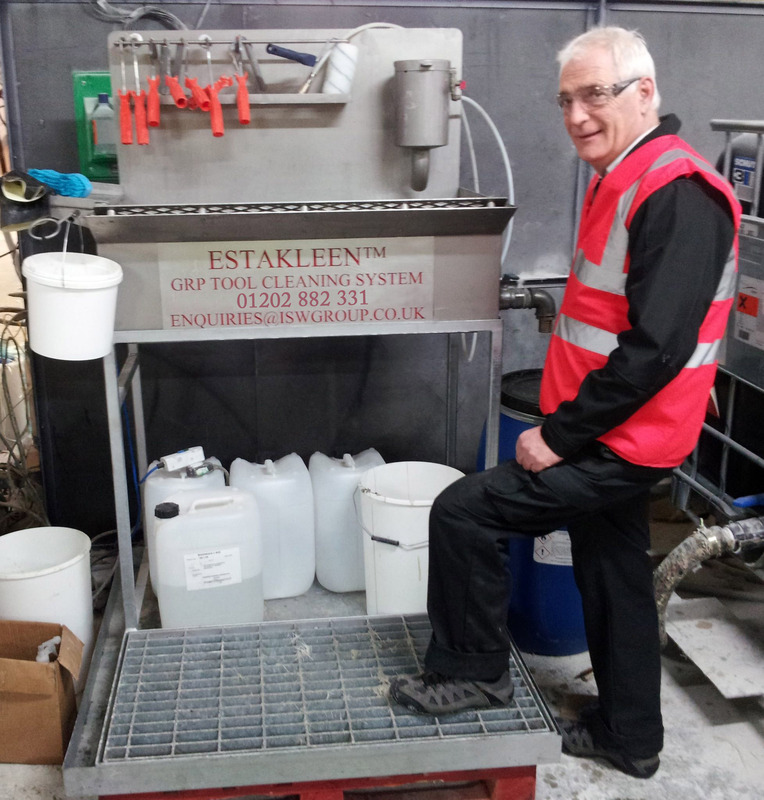 Installation of Estakleen Systems has meant a cleaner, safer and healthier working environment for our employees, as well as offering reasonable cost savings against the alternative solvent and solvent replacements on the market. The fact that the system is delivered, removed and recycled is also an advantage to the traditional solvent disposal method and has meant we have benefited from a decrease in transport, storage, disposal, environmental and insurance costs. The elimination of acetone as a tool cleaner has reduced fire risks, improved the health and safety within the factory environment and prevented emission of 30 tonnes per annum of VOCs to atmosphere. All these benefits have been gained at no additional cost. 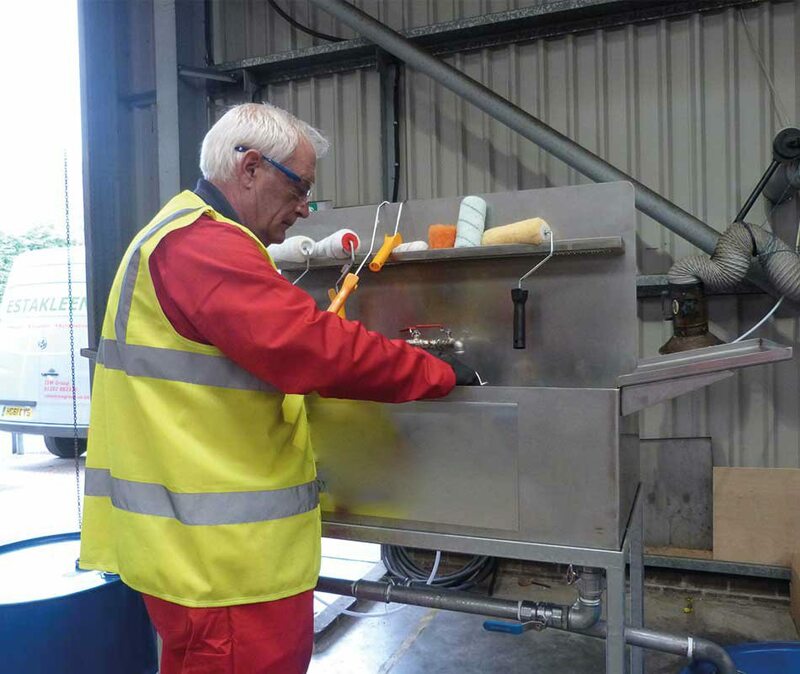 An initial reluctance from the laminators to move away from acetone was overcome once they had been trained on the Estakleen System and experience was gained through practice.